Oh boy, what a day this was! Never in my life did I think I would ever have to choose one enemy over the other. But today, I had to come to such a decision as that. Of course, the decision was pretty cut and dry since one was in the right and one was in the wrong. Well, let me start at the beginning. Suddenly, Jackford saw someone who made him furious. He started walking toward that person while stating to Sanderson, “I’ve been carrying you for three years. I’m through now.” Sanderson was upset because he was going to have to sell anything. It was obvious that Jackford didn’t have time to talk to him. He was obviously on his way to something more pressing. He walked up to Asa Manning who was finishing up some business with John Hamilton right outside the bank. Suddenly, Jackford hurried up to him and punched him over and over. Micah saw it and immediately stepped in to intervene. “Did you ever hear of assault, Jackford?” Micah asked after he managed to get between the two of them. “Nobody steals from me or mine!” Jackford proclaimed, obviously accusing Asa of the crime. Jackford proclaimed. Suddenly, Jackford again charged at Asa accusing him of buying friends with his money. Again, Micah tried to separate them. Mark and I were walking out of the general store about this time. I walked out in time to see Oats trying to fight Asa. “Well, it looks like Oat’s full of beans today,” I commented to Bert Sanderson. Well, if I said I was expecting what came next, I’d be lying. Oat reared back and punched me, knocking me through the hitching post and into the street. Boy, this man could punch hard! Of course, from the look on Mark’s face, one would think he had punched him! This of course made me angry! I was not going to let this man get away with that! Micah tried to stop it, but he knew better then to get in my way! Oat punched me again. I reared to punch him, but instead punched my hand right through a window! We f ought a little longer when Micah finally shot his gun off. That got both of our attention. Micah ordered us to break up the fight. “Oat, you’re gonna get out of town and stay out of town till you’re grown up and learn to behave like a grown man!” Micah ordered. I was waiting for him to start something else, but he finally walked away. For the first time, Mark finally spoke up. “That old bear would rather fight than eat!” he declared. I thought he was pretty observant! “He’ll do no more fighting in this town!” Micah stated. That was all right with me. That man could sure fight! I rubbed my jaw. I still felt the pain of his fists! “People just don’t seem to cotton to Mr. Jackford, in spite of all his money,” Mark commented. For that third time that day, Bert Sanderson was complaining. But this time he complained to Asa, stating the he had to auction off everything he had. I guess Asa didn’t realize I could hear him. But I suddenly heard him state, “I wouldn’t worry about him. He ain’t gonna be around much longer. I turned and looked in the direction Jackford had just ridden off in as I thought about that statement, hoping it didn’t mean what I thought it meant! Okay, now we get to that day. It was a cold, windy day. It was also the day of Sanderson’s auction. All the men had come into town that day for the auction. Mark and I were also on our way. But before we got there, one man made his presence known, startling the townfolks. 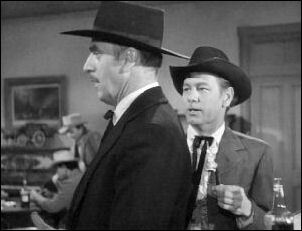 John Hamilton was just leaving the bank to go over to the auction when he saw a stranger ride up. Asa came up to him and made some casual conversation with him. He assumed he was coming in for the auction, but the stranger stated he was there for other reasons. Hamilton hinted that he could talk banking business with him, but the stranger stated he would not need it. “Hamilton’s my name, sir. Incase you change your plans. Suddenly, the stranger turned around and walked up to John “My name is King, Mr. Banker. Tom King. I’ll be staying here at the hotel.” From the look on Hamilton’s face, it was obvious he knew King, and the knowledge wasn’t pleasant! Immediately, John Hamilton hurried to Micah who was just about to walk into the Blacksmith’s for the auction. He announced to Micah that Tom King was at the hotel and that he had business there. That was when Mark and I got in for the auction. Little did I know that I wouldn’t see a single second of the auction! “Who’d he be after, you know?” Micah wondered. But John didn’t know. Now, I must admit that the name alone was enough to make me want to spit! I immediately grabbed my rifle and told Micah I’d come along. He tried to stop me, but I wasn’t asking – I was telling him that I was coming along! I told Mark to wait right there for me, but Mark wanted to bet at the auction. “It’s your money,” I stated. Then Micah and I took off for the hotel. The auction was going full-swing when John Hamilton suddenly walked in and announced, “Tom King’s in town.” The room suddenly got quiet as they wondered who he was after. That’s when I revealed to Micah just how well I knew this man. This man made my skin crawl! "Micah, this is Tom King. He will kill you or your grandmother if someone would write a warrant and if the price is right,” I stated angrily. That’s where I came in to the conversation. “You here to kill?” I kept the stern, angry look on my face the whole time. I could tell by the look on his face that he was. “Who?” Tom kept silent. “I asked you a question, Tom.” I sneered at him. “That doesn’t necessarily mean that I’ll answer,” he shot at me. Micah could tell I hated this man. He suddenly cut in. “I’m handling this, Lucas Boy!” he stated. Then he turned to King. "I know how fast you are King and I know how you work. So let me tell you not to provoke a gunfight here"
“Supposed somebody draws on me?” he asked. “Nobody’s iron-headed enough to do that,” Micah answered. That’s when we found out someone was paying him. "Since when does the law hire killers?" I shot out at him. He stated he worked independently now. “Slowing down, Tom?” I asked, still wanting to get to the bottom of this. "No.....no complaints about my speed as of yet.....Lucasboy," mocked Tom. He said he always found it better to work for someone holding a grudge then some old marshal who can't handle it. My temper was flaring, and that was a dangerous thing. Micah knew that so he put a hand on my arm to calm me down. “It’ll be a reasonably fair fight, Marshal,” Tom King was proud to assure us! I turned around then and saw Asa standing in the doorway listening to our conversation. The look on his face told me everything. That’s when I knew the truth. Micah was telling King that no one in North Fork had a chance against him. That’s when he looked straight at me and stated, “Oh, I don’t know, Micah. Lucas here is pretty good. Being good is what we got paid for, remember?” That was a conversation I hadn’t really wanted to discuss, but he forced the issue knowing it would make my temper flare up again. The price was $500. I knew exactly who it was, and King knew I knew. That’s why he gave me the honor to announce the answer. “Oak Jackford,” I stated. Micah was confused and didn’t understand why he would want to kill Jackford. I knew, because I overheard the conversation the other day. “$500 from Asa Manning, Micah. $500. That’s all it takes, and you can name your man!” I stated that it couldn’t happen to a better man, but Micah was still the lawman and he had to try to stop this from happening. “Of course, Jackford doesn’t have to draw,” I commented. I knew that wouldn’t happen, but I went with Micah to the auction to see if we could get some town folks to help us against King. Well, everyone was willing until we named the person King was after. That’s all it took. Every single man in that room hated Jackford, and nobody wanted to be a part of helping him. We walked out, defeated, knowing we were on our own. Mark watched us leave and realized that we may have to do some fighting. He was worried. So, no longer interested in the auction, he followed us out. I didn’t know he was outside. Micah and I went outside to talk. I wondered if Oat would come in, and Micah stated he didn’t figure Oat would miss the auction. I wanted to try talking to King again. Micah wanted to know why I should be the one to do anything for Oat Jackford. I was mad, and I would stay mad until this man was gone! “Let’s say it’s got nothing to do with Jackford one way or the other,” I answered him. I didn’t feel like getting into this with him. I just wanted to go talk to King. “Lucas, your no Curly Bill! I’ve never known you to pick a fight!” Micah argued with me. Micah stopped me and tried to advise me to think more about Mark. But we both knew I was a better shot then Micah could ever be. And I knew that I had to stop this from happening! Mark had walked up behind us and was listening to me. I’m afraid I put fear in him by my angry words, but the words were out now, and I couldn’t take them back. “Pa,” Mark suddenly called out. That’s when I knew he was there. I turned to him. “You’re not going to fight Tom King, are you?” he asked worriedly. “Not if I can help it.” I turned away from Mark and looked at Micah. They both needed reassurance. I’m not sure which one needed it the most. “I’m just gonna try and talk him out of making any trouble.” Then I started to walk away. “If he won’t listen, what then?” Micah suddenly asked. I turned and looked at him. I think he knew the answer to that question. King would be stopped one way or the other. Without saying a word to Micah, I turned away and walked into the saloon. I sat down. I was calmer now. My voice no longer held anger as I softly sat and laid my rifle on the table. Very calmly, I stated, “Look King…uh…I’ve got no particular use for Oat Jackford, but this is my town. Tom, I’m asking you to leave quietly.” I said this softly and with much calmness in my voice. I could feel my temper rising again. 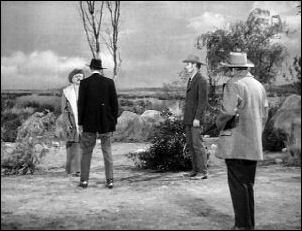 “I’m trying to tell you you’re a grave-robbing child killer. You’d cut your own mother’s throat!” I stated. "Don't forget I'm ugly and I smell bad," said King. "Luke, I know what you’re trying to do, but I'm not fighting you," said King. I assured him I wasn’t looking for a fight. I slammed my hand on the rifle and picked it up as I stood. “I’m just expressing a personal opinion!” I sneered out. Then I walked out the door. The moment I walked out, Mark rushed up to me and wanted me to assure him everything was settled. I didn’t want to lie to him. But I didn’t necessarily want him to know how bad things really were either. So I simply stated, “Almost.” Then I told him to go back to the auction. I could tell Mark didn’t want to go. I watched him walk away slowly; knowing now was not a good time to argue. When he was out of earshot, I told Micah I couldn’t talk him out of it. Micah and I decided I should go out of town and Meet Jackford. I was going to try to talk him out of coming in or to get some of his boys to help him fight King. I told him I’d go wait for him outside town. I knew Micah. So I sternly looked at him and stated, “But if you have any ideas, Micah, about straightening out King by yourself, forget the, huh? Even Micah knew better then to argue with me! He simply told me he wouldn’t do anything. I started to leave. Mark was standing just down the sidewalk, not quite obeying my orders. I stopped when I got up to him. “You better get back inside and get warm,” I told him looking into his eyes. I knew he was worried, and assuring him wasn’t going to help. So I left it at that hoping he would obey me. Well, I had told Mark to go inside, and he didn’t obey me. I told Micah to leave King be and he didn’t obey me. Going against my wishes, he headed into the saloon to “talk” to King. “As Marshal of North Fork, I’m giving you official notice to get out of town,” he announced boldly. I guess Micah was getting desperate. He told King he’d throw him in jail if he didn’t leave. This amused King and he asked what charge. Micah answered, “Disturbing the peace.” King knew Micah was bluffing. He was well within his rights. So, he was more than willing to go. He called Micah’s bluff by standing up, Micah had to leave. I didn’t have to wait for Jackford long. I warned him to stay out of town because Tom King was waiting for him. I told him Manning paid King to kill him. This didn’t phase Jackford in the least! “If King’s come to kill me, he’s gonna get his chance,” Oat stubbornly answered. I was desperate. I didn’t want this turning into an ugly gunfight. “Oat, will ya' at least go back and get some of your boy to help you? You can’t handle King alone!” I insisted. But Jackford gave a short laugh. "Can't I?" Then he rode off to town. Mark and Micah watched us ride into town. They were both disappointed to see Jackford with me. Micah walked into the saloon and motioned to King that Jackford had arrived. King was happy to hear this and started getting ready. Micah stepped in to stop this, but Jackford told Micah he didn’t need his help. I again tried to stop it, but Jackford didn’t want it stopped. Micah stated they would do their killing outside of town. That was fine with them. “Let’s take a walk, old man!” King stated to Jackford. With that, they both left the saloon and charged down Main street out of town. Micah and I followed close behind them. Mark came running from the church steps where he’d been anxiously watching and waiting. He hurried up to me and stopped me. "There's going to be a fighting, isn't there Pa?" I was mad this senseless act was happening, so I stated, "There's going to be a killing!" I was already angry. Mark’s words didn’t help alleviate any of that I turned and glared at him. Sternness on my face, I knelt down to glare straight into my son’s eyes. "Don't you ever be glad a man is going to die," I said with disbelief and anger. Then I gave him a stern stare, letting him know how inappropriate his remark was. My stern look had the desired effect on him. Mark grew very uncomfortable as he tried to explain his remark to me. "Well, I’m not glad about Mr. Jackford that way,” Mark stuttered. “I kinda like him.” I continued to stare at him, as I waited for a better answer then that. My stare was very uncomfortable to Mark. “I'm just glad it ain't you." Mark finally was able to stutter out. Mark looked away, no longer able to stand the look I was giving him. After one more quick look, forcing his eyes to focus on mine once more to show I was still disappointed in him, I quietly stood up and walked away, leaving him to think about his remark some more. When we reached the edge of town Micah tried to talk to King again. We all knew Jackford didn't have a chance against Tom King. But we shouldn't have under estimated the man Oat Jackford was. "Jackford! They tell me you, uh, you’re a horse thief!" King yelled, trying to provoke him. "That's a lie!" Jackford yelled back. "They say you got the habit of juggling your own books." King yelled, still trying to provoke him. That really made Jackford mad! “I'm gonna shove that right down your dirty throat!" He yelled. He started walking toward King. "Come on old man, draw!" King ordered. But Jackford just kept getting closer and closer to King. King kept trying to get Jackford to draw, but he wouldn't. Micah reminded King if he drew he would be hanged for murder. The closer Jackford got without drawing, the more nervous it made King. Jackford got right into King’s face. He had an angry, mean look on his face. We all stood to see what he would do. "You got a reputation. Back it up!" With that Jackford punched King hard, throwing him back. He grabbed on to me as he slammed into me. I grabbed him by the coat. “I wouldn’t take that from a dog!” I sneered, throwing him back towards Jackford. Jackford punched him again, and again King slammed into me. I grabbed him by the back of his collar. “Slowing down, Tom?” I asked. Then I threw him at Jackford again. Jackford punched him three more times. By this time King had his gun in his hand. Jackford twisted the gun right out of his hand. “Now I’m gonna put you out of business!” Jackford stated as he took the gun and punched him one last time. King fell to the ground, defeated. Jackford wasn’t done yet. He was ready to fight Manning. After all, Asa wanted him dead! But Manning ran like a scared chicken! He ran to hide behind some rocks. Jackford called for him to come out and fight. But after the treatment King had gotten, Manning had no desire to tangle with him. “Oat, you’ve cleared the field!” Micah proclaimed, relieved. Then we left, leaving King behind lying in the dirt, to recover for himself. We walked back to town. But Asa was still there. He was mad at King. Asa picked up King’s own gun and pointed it at him. “$500, Mr. King! That’s what I paid and what did I get?” He was mad that Jackford was left alive. King begged for his life, but Asa shot him. In cold blood, then took the money he had paid him back. We heard the shot and rushed back. Micah caught him taking the money. He still held the gun and was standing over King’s body. "You made a big mistake Asa!" Micah yelled. Asa didn’t seem to understand how the laws of this country worked. "There isn't a jury in the state who would convict a man for shooting Tom King!” He argued. “I'm famous!" All three of us looked at each other, but kept quiet. “You’ll testify for me, won’t you/” he asked me. I turned and walked away. I couldn’t believe he had the gall to even ask me that! Mark was anxiously waiting for us to get back. Jackford wasted no time in getting out of there. I looked at Mark as he came up to me, hoping his words would be more pleasing to my ears this time. They were. "I'm glad Mr. Jackford is all right." "If Tom King couldn't kill him, nobody can," said Sanderson. Then I had to make a remark. “Well, the only way old Oat Jackford will die is in bed; with 30 great grandchildren standing around sucking their thumbs waiting to count his money." I stated. I put my arm around Mark’s shoulder as we happily headed for the horses to go home. 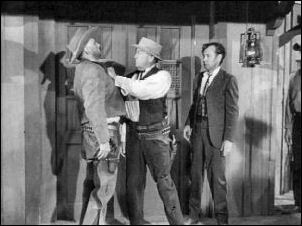 piddlin' stuff.....Bert Freed appeared in two episodes ― The Money Gun as Oat Jackford, he is the cowboy who Asa Manning hired Tom King to kill ― Short Rope for a Tall Man as Ben Crown, the owner of the horses that Mark almost got Lucas hung for stealing. William Phipps as Asa Manning. He's the one who hired Tom King to get rid of Oat Jackford. John Dehner appeared in four episodes ― The Money Gun as Tom King a hired gun ― The Blowout as Al Walker a gunslinger ― The Baby Sitter as Wood Bartell, a self-righteous, bigoted father. (He was Fancy's Father) ― The Prisoner ― as Major Aaron King, a ex-Confederate officer who seeks revenge on Lucas. Jason Johnson appeared in two episodes ― Deadeye Kid as Cramer, he was the partner that got killed ― The Money Gun as Bert Sanderson, the one who hired Tom King to kill Jackford. Frank Hagney played Nels/Nils in this episode. How many actors played Nels, Nils or was it Neils? Was it Swenson or was it Svenson? For the answer in detail and pictures.....go to my trivia answer page. See the Blacksmith page. 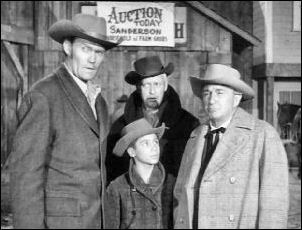 Earle Hodgins as the Auctioneer. 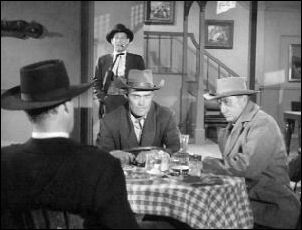 Rod McGaughy has appeared in nine episodes ― The Dead-eye Kid as one of the cowboys looking for Mahoney ― The Wrong Man as one of the townsmen at the carnival ― The Woman as Old Man Healey's Henchman ― The Money Gun as one of the townsmen ― A Matter of Faith as a cowboy in the crowd ― The Spiked Rifle as Henchman in the Bar ― The Lariat as Card Player ― The Baby Sitter as a Barfly ― Short Rope for a Tall Man as One of Crown's Henchmen/Mob Member. Whitey Hughes as the bartender. 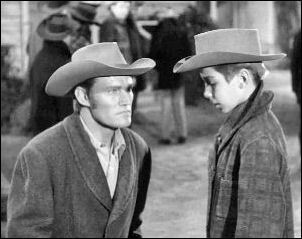 Whitey was a well known and respected stuntman, he appeared in twenty-seven episodes of The Rifleman and still counting. Whitey had over a 50-year career as a stuntman and stunt coordinator, he has been praised as one of the top stuntman in Hollywood. Whitey was the best of the best! *I like these characters — Oat Jackford and Judge Hanavan — too bad they didn't keep them in more of the episodes. I did notice that Sam Peckinpah was noted as one of the Teleplay — maybe that was why Jackford was in this episode - wasn't he one of Sam Peckinpah's characters?